Some smells, like fear, anger, incompetence, death, mold and rotting meat, stay in your nostrils forever. First of all, once again, our gratitude can never be expressed for all the words of support, the prayers, the offers of help and the help already given to us. It is greatly appreciated and we wish that words could do more than just say THANK YOU. We are back in New Orleans as you know, and doing whatever needs doing. Baton Rouge Church of Christ has managed to get trucks in here with food, water and ice, and we've been distributing them all day for days, finding people that apparently no one knows are here. Many of them extremely elderly and extremely poor. We load up the Voodoo Mobile and drive a grid looking for people, some of whom haven't had much food in two weeks. With no power in most places still, there is an information void, so while there are truckloads of food 8 blocks from them, they don't know it. And some are too frail to get there anyway. The gas situation is a mess. You try to buy a couple gallons here a couple there, but it's all black market. I'm ready to write on the car, "Hey mister, you got power back on YOUR street, how about selling me the gas you still have in your generator!" The Army and National Guard are setting up areas and we see squads of them walking the streets every day, and choppers flying overhead all day and all night. There is now an underground economy here on Algiers Point with many of us trading this for that and passing on information. Of course we have to do all this before the 6PM curfew. Below are some vignettes of what we've seen. Woman in her late sixties, pushing a shopping cart in the 94 degree heat with a nearly two year old girl in it. She was trying to get to Blaine Kern's food area, but it was a long way away. We found her, loaded up her cart, and the tiny one, oblivious to the plight of her grandmother, jabs a box of apple juice I'd given her back at me to open it. Ancient man named Moses Page, sweeping his living room. Out of insulin and food. Sees us coming and says Thank you Jesus. Keeps calling me Ma'am. I finally told him I'm not Ma'am, I'm just Rebecca and he laughed. We need to find him some insulin today. Pages of a notebook, with notes Dave or I have taken. Notes include addresses sent by email, "Can you check on my house?" We're taking pictures but are hooked up to the internet via dialup through New Mexico so it's a long process. Also in the notes are names and addresses of people whose medications are running out and a plan is still not cemented to get them to medical help to refill those prescriptions. No gas to get them there but we're working on it along with the Church of Christ people. 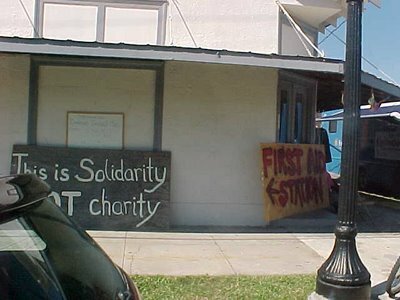 Little clinic set up in a Black Muslim Mosque. Two EMT's with pierced ears and tattoos running all over to addresses on bicycles with stethoscopes around their necks. One woman locally is 102, we've personally found several in their 80's. Bernice around the corner was born a block from where I live, has lived here all her life, she's 85. 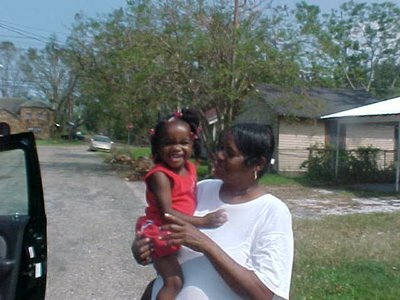 Had been in an assisted living home but was told if she had a place to go she should go there, so she went home and weathered Katrina by herself in her home. Still sits on the porch every day feeding the pigeons. Not senile at all, just old and alone. Not the only one like that we've found. Got an SOS that there was an OLD man down off the point who was out of everything. We get to the house and I go to the door. I bang and bang. I can see his feet on the bed. He's NOT moving. After five minutes of this, my stomach is in my mouth and I call David. We're pretty sure that we are too late getting to him. Suddenly his feet stir and he opens the door for us. Do you have food Mr. Fink? Yup. We start looking through his cabinets. He has a can of soup and a box of hot chocolate mix and a few other paltry things. He won't eat veggies or fruit, and the MRE's are too hard both to navigate and to digest for most of the elderly. His meds are almost gone, and he's very worried about the "shot." What shot, we ask. That shot, that shot. Turns out he doesn't have much food but wants a tetanus shot. We loaded up the car and took food over to him along with some cops to see if they could take him to get his meds refilled as we'd heard there was a doctor at Dist 4 station. They tried to convince him to evacuate instead. It's not gonna happen. He's now on our list to keep track of. Old woman and her son, Miss Sarah, live in a rundown area. We're directed there by someone who knew they were there. We hand her a bottle of juice and she looks at us like we'd just handed her the winning lottery ticket. Yesterday we're directed to a home which had more people in it than that and this home will most assuredly be bulldozed when this is over. It has a serious lean to it. We arrive at the same time as a Red Cross truck. We find that there are two families in there. 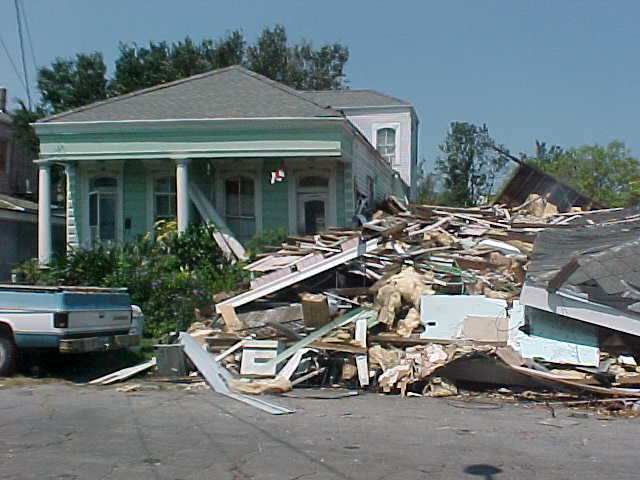 Their grandmother had passed away the week before Katrina, then the second family's house burned down, so now they were all together in this little house. David was throwing things in boxes, into Red Cross people's hands, dragging it up there himself, anything we had that we thought they could use. 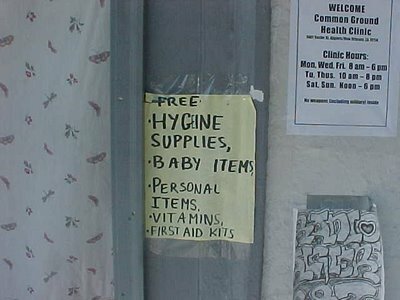 I asked the Red Cross woman if there were any young women in there, yes was the answer, so we included tampons, which are at a premium. Toilet paper, tampons, these things are going fast if we have them in our car. Trucks roll in with stuff, random stuff, and we just load up whatever comes in so some days we're handing out cans of chicken, two cans of green beans, nutrigrain muffin bars and grapefruit juice. Other days we have nothing but green beans, corn, peas and cases and cases of canned pears. It's all appreciated. A case of toilet paper was gone from our car in less than an hour as we gave it out. Not much protein around, that's starting to worry us as there are so many diabetics and people with high blood pressure. No mail service here yet. We have power, but most don't, so ice is still important and it comes in by the truckload. The generosity of people has been amazing. FEMA has not been any help, in fact probably a hindrance in some cases, like cutting the lines to the Jefferson Parish sheriff's department, turning away three truckloads of water that WalMart sent and telling the Coast Guard they couldn't deliver the 1000 gallons of diesel they were bringing in. While they're all figuring out jurisdiction and measuring the male parts of their anatomy, people are suffering. And don't get me started on the paperwork issues. We've been working with the animal rescue folks too. Many have been rescued, more need to be. We don't know where they're taking them, but we keep scrounging up dog and cat food wherever we can and giving it to people who are 'babysitting" a stray cat who lives in the neighbor's house but got left behind. The feral chickens on the Point are being fed by us, yes there really are feral chickens, and the stray cats wait for them to eat then go to the cat food bowl! Today we'll head for the food distribution area, get some ice and take them the list of people who need to get to West Jefferson Medical Center. From there we'll see. We need a day to figure out our own situation in terms of bills. And then we'll go back out tomorrow. Call a few of the old ones today and see what they need, take it to them if necessary but our gas situation is now at a point where we have to watch every drop we use. We'll probably scavenge some somewhere. If one had pride when they got here, they learn to ask for help really quickly once they're running around here. Funny thing is that the Army, cops and National Guard all know our car and leave us alone as we run around. Have been taking some pictures, not many, been too busy really but will try to get more of them and send some to you. I know this is disjointed, but thought you should know we're just fine. The critters are delighted to be home and hey, someone brought us cigarettes last night. (All you ex or anti-smoking folks can just close your eyes and get over it!) They also might be useful in our little underground economy. You've all asked what you can do. Right now not much but keep us in your thoughts and prayers. We will absolutely ask if we need something. We've learned that lesson well here. PS S can you print this out for C please? Thanks! Interesting that as this was written, some things were left out because we weren't sure how long the phone line would hold out and our power was a generator. The little girl was in her grandmother's care, and her great Auntie's as well, because her mother was incarcerated at the time. The ladies hinted at a drug problem with the little girl's mother. But at that time they had no idea where her mother had been moved to, and they were worried. They also had no cash, no food stamps and the mail wasn't getting through. They, along with Moses, lived on a forgotten part of Ptolemy Street in Algiers, near the cemeteries. They and Moses were the only people on that street at that point. The cops who went with us to Mr. Fink's house were less than useless and wholly disinterested. We had gone to Dist 4 station to see if we could find the doctor that we'd heard was there. There were huge barbecues set up and very tired, haggard cops. One very cranky dispatcher was manning a battery powered communication system and the phones still weren't working properly at the station. The cops, two local and one from ICE, accompanied us to Mr. Fink's house when we told them that he'd run out of his meds and we needed to get him to a doctor. They walked in, treated him like he was a problematic child, and harangued him about evacuating. It was eminently clear by Mr. Fink's reaction, first laughingly saying his house was all he had, then finally defensively putting his foot down, that he was not going to be moved out of that house. Once that was decided by him, the police told him he was our problem. We eventually went back to the station, a couple days later asking if there was any gasoline around. A guy, not a cop but working with the cops, said he had some but that he wasn't allowed to sell it, but would indeed sell us some for $5 a gallon. We paid him for a five gallon can of blackmarket gasoline, but it allowed us to get around for a little bit longer until we could find more. The clinic on Teche is still there. It was being run and is still being run by Common Ground. 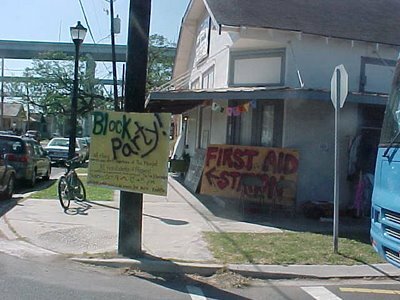 They were the first medical care on the scene there, and they determined to make it a permanent fixture in the neighborhood. We've heard they're still there and doing remarkable things in the community. At the time that this was written, they had little more than some band aids and aspirin, but knowing they were there made a huge difference to the neighborhood. 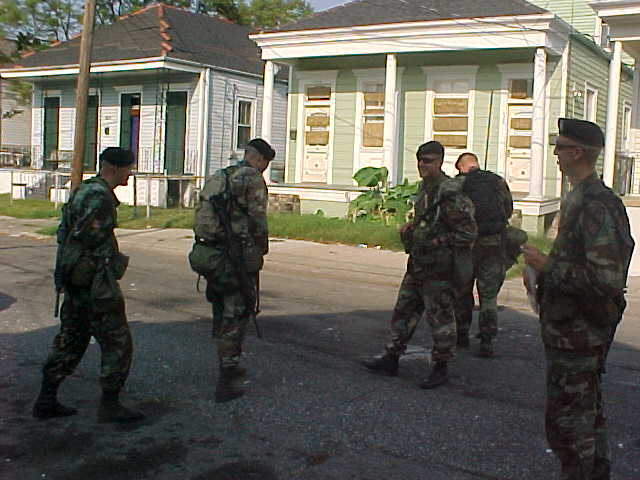 They later set up a tent city on Claiborne and were sending their people into the Ninth Ward to gut houses.